This weekend was an exciting weekend for thrifts. On a whim we decided to head to this little store while we were down the shore with nothing to do. I was super delighted to find this shaker just waiting for me to swing by and pick her up. 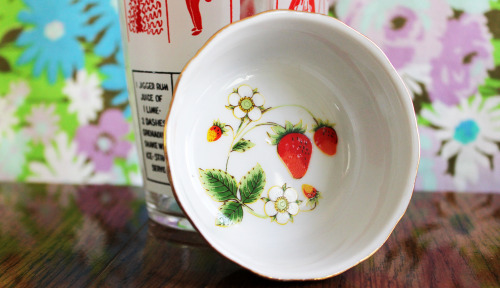 The other little score is this cute dish with strawberries printed on it. Anything with fruit on it (especially oranges, lemons, and strawberries) I am automatically drawn to. And these type of dishes are great to put things like buttons and bobby pins in. My plan is to get updates on some of my big projects we've been working on up this week! ***Purchases were from St. Mary's This 'n That Shop in Rio Grande, Nj. One of my favorites for when we are on vacation.